Autographed Opera Star by dOra RP - Entertainers - Real Photo - Vintage Postcards | VintagePostcards.com: vintage, old, antique postcards for collectors. 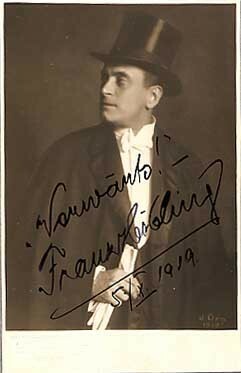 Fine portrait of Frank Gibling(?) with d'Ora (Dora Kallmus) 1917 monogram at lower right and a "Magasin Metropole, Wien" (Vienna, Austria) blindstamp at lower left in the white field. Autographed by Gibling. Ms. Kallmus was a renowned French photographer of the period, working mainly in celebrity portraiture.